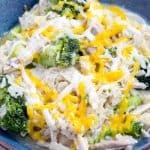 Pressure Cooker Chicken Broccoli Rice "Casserole"
All the comfort of a casserole, but all done in a pressure. And still completely delicious! Place whole chicken in Instant Pot breast side up. Then add water, salt, and black pepper. Lock lid, close vent, and set manual timer for 30 minutes at high pressure. Place broccoli florets in a large bowl and cover with cold water and allow to defrost completely. Obviously, this step is not necessary if using fresh broccoli. Then pour broccoli into a colander and allow to drain completely. Pass broth through a fine mesh strainer and return to pressure cooker. Add broccoli to pot and set manual timer for 0 (zero) minutes. Once cook time is complete, quick-release pressure. Pour broccoli into a fine mesh strainer, making sure to reserve all the broth. For white rice… Return broth to pot, along with rice, and cook for 4 minutes at high pressure. Once cook time is complete, quick-release pressure. For brown rice… Return broth to pot, along with rice, and cook for 20 minutes at high pressure. Once cook time is complete, quick-release pressure. Meanwhile… remove all chicken meat in large pieces. Discard skin and bones. Add chicken, broccoli, and cheese to pot and mix well. Serve & enjoy! This recipe will not actually make a casserole, it's more the idea of a casserole. There will be some broth in your bowl. But the longer it sits, the more the rice will absorb the remaining liquid.